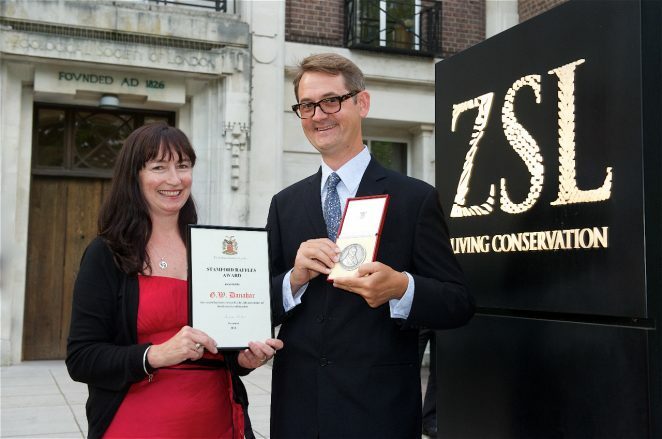 A Brighton schoolteacher has been presented with a top award from the Zoological Society of London. Dr Dan Danahar, Biodiversity Coordinator, and teacher of Environmental Science at Dorothy Stringer School is the proud recipient of the 2011 Stanford Raffles Award. The medal is awarded for outstanding contributions to the advancement of Biodiversity Education. The award was presented by Professor Sir Patrick Bateson, President of the Zoology Society who said, “He has converted an ordinary-looking school campus in Brighton into an extraordinary network of chalk grassland, aquatic and woodland habitats; worked with his colleagues to bring biodiversity and sustainability into the core of the curriculum; set up the highly successful city-wide Big Biodiversity Butterfly Count; and led the city’s response to the 2010 International Year of Biodiversity.